Steamed Semolina Cake is a famous finger-food snack from South Region of India. Loved and enjoyed various ways in every home in India, these extremely fluffy steamed cakes are lite on stomach, easy to digest and are fat-free. Traditionally these cakes are made with soaked and ground, rice and hulled black lentils, I often use semolina meal to make these cakes. 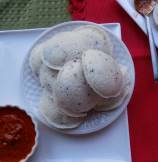 Semolina is already coarse ground and once soaked for 10 minutes, it is perfect to make steamed Idlis (cakes). Today, I am sharing with you steamed cakes with fine chopped onion and cilantro and toasted mustard seeds. 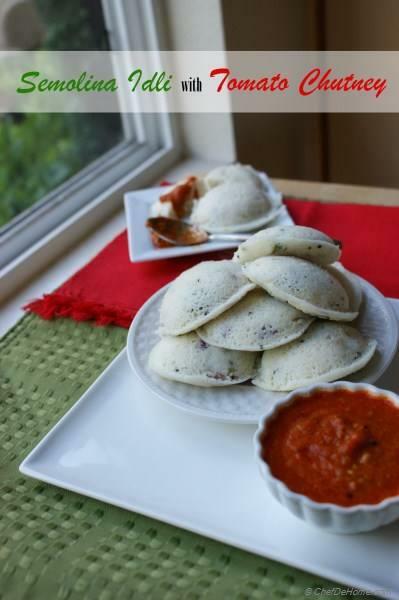 Even though steamed cakes are perfect on its own, addition of onion and cilantro and fragrant mustard seeds enhances the texture and taste of these yummy healthy bites. 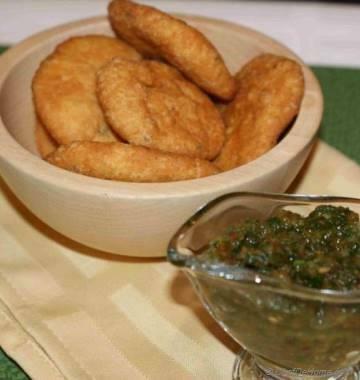 And, don't forget to make and serve tomato chutney with these yummy treats. Tomato Chutney is very simple to make and it stays good in refrigerator for 2-3 days and can-be frozen for up to 1 month. 1. In a small pan, heat 1/2 tbsp oil. Add mustard seeds and heat till seeds start to sputter. Switch off the heat and leave seeds aside. 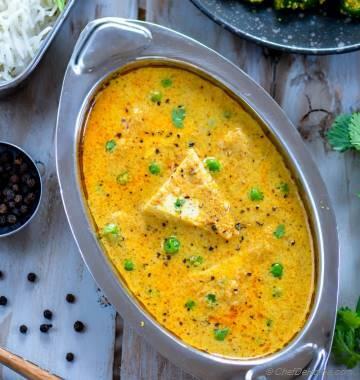 In a bowl, add semolina, half of the water, yogurt and half of mustard seeds and mix well. Make sure batter is not lumpy. Keep adding water 1-2 tbsp at a time until batter has pan cake batter consistency. If using Baking Soda, mix in soda into the batter as well. If using ENO Salt, wait to mix salt just before steaming cakes. Leave batter aside for 10 minutes. 2. To make tomato chutney - Chop tomato roughly. In a pan, heat 1 tbsp oil, add tomatoes, sugar, red pepper powder and 1/2 tsp salt. Saute till tomato are cooked, little mushy and skin has stared to disintegrate. Let tomatoes cool a bit. Once easy to handle, transfer tomatoes to blender and blend to a puree consistency. Mix in half of the remaining pan roasted mustard seeds into the chutney. Taste and adjust salt and keep aside. Tomato chutney stays good in refrigerator for 2-3 days and can-be frozen for up to 1 month. 3. Grease the cake steamer (idli pan) molds. If using ENO fruit salt, add salt to the batter and stir well once. Mix in chopped onion and cilantro. Immediately pour the batter into molds. 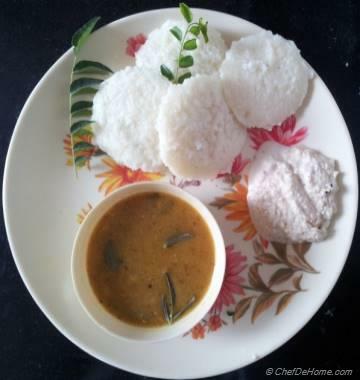 If using microwavable idli makers, microwave for 4 minutes. If using regular steamer, steam for 5 to 7 mins. Before taking out the cakes (idli) from molds, do the tooth pick test. If tooth pick does not come out clean, stream cakes for 1 more minute and then check again. 4. 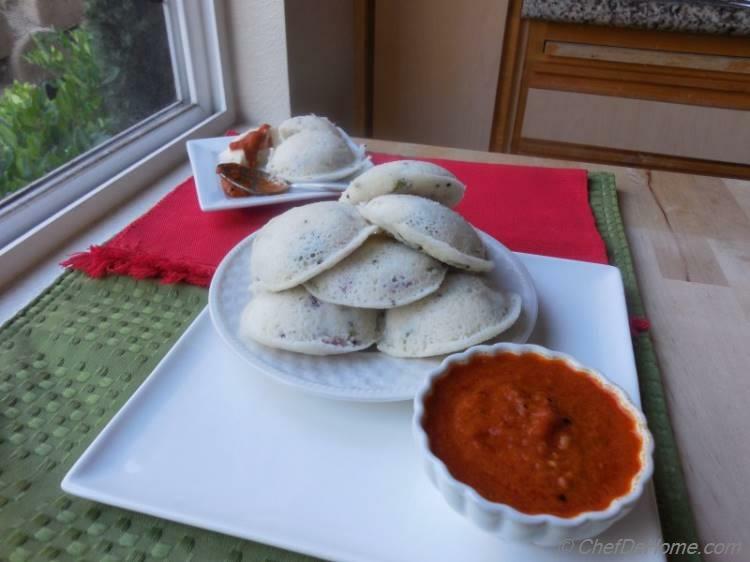 Remove steamed cakes (idlis) from molds and serve hot with tangy sweet and sour tomato chutney. Enjoy! !